Not content with being the first person to rack up one million Google+ followers, US pop icon Britney Spears has further demonstrated that Google+ isn’t just the domain of geeks by becoming the first person to break the 2 million follower mark. Spears has hit the new landmark just over two months since she first reached seven figures. Based on the timing, she’s been adding new followers at an impressive rate of close to 30,000 each day. Despite reaching this new landmark, Spears has a far larger following on Facebook (17.3 million fans) and Twitter (13.2 million followers), and she often shares the same updates across the threee platforms. Those hoping to video chat with the singer have thus far been disappointed as she has not explored the Google+ hangout feature yet. Google has been much criticised for leveraging on its other Web properties and services — such as search and YouTube — to help steer users to the social network, but its growth has been impressive nonetheless. The social network racked up 10 million users in just 16 days, faster than any other site in history, and the most recent statistics, from December, show it has 90 million registered members. The fact that musician Spears is so well followed suggests that it has a broader following than many give it credit, that or everyone seems to love Britney. Britney Spears isn’t topping these charts on popularity alone and her (her team’s) engagement has drawn impressive numbers. 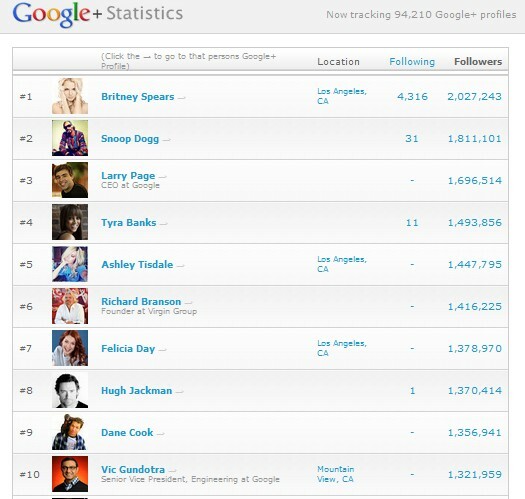 Not only is Britney well followed, she is also doing a lot of watching, as she follows more than 4,000 other users. 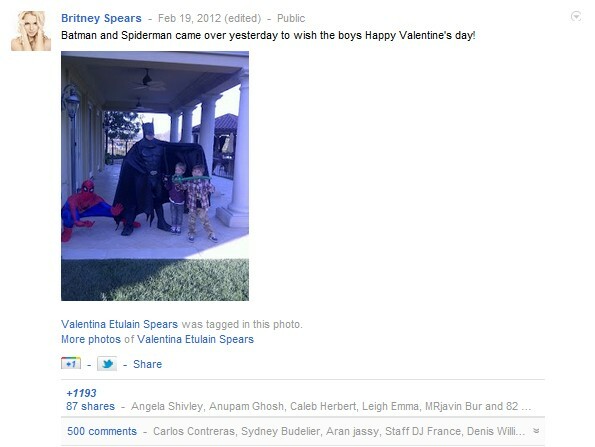 Posts that show her life from a number of angles, such as the one below which shows two of her kids having fun on Valentine’s Day, are a significant reason for her popularity on Google+. Given her continued popularity it seems likely that Britney will continue to top the rankings for some time but there is stiffer competition coming. US President Barack Obama recently joined the service and making use of features like Hangout, while other celebrities are taking to the site. Don’t discount challengers in Asia either, Google+ is making good progress in the region. The company signed up Japanese superband AKB48 last year, and the girl group is bringing its considerable fan base across the continent to the social network in large numbers.